Leaves land in private ownership. Can result in an income tax deduction and reduced property and estate taxes. A conservation easement is a legal agreement between a landowner and a land trust that permanently limits uses of the land in order to protect its conservation values. It allows you to continue to own and use your land and to sell it or pass it on to heirs. A conservation easement is a flexible land protection tool. It must protect the land’s conservation values, but it can also be fashioned to meet the personal and financial needs of the landowner. A conservation easement donation can qualify as a tax deductible charitable donation. For income tax purposes, the value of the donation is the difference between the land’s value with the easement and its value without the easement. Placing an easement on your property may also result in property tax savings. Perhaps most important, a conservation easement can be essential for passing land on to the next generation By removing the land’s development potential, the easement can lower its market value, which in turn lowers estate taxes. Can result in a substantial income tax deduction. Can be structured in a way that allows you to continue to live on the land or to receive a life income. A donation of land to a land trust assures that the conservation values of the land will be protected (although our focus here is on conservation land, commercial and residential properties can also be donated to a land trust, with the understanding that they will be sold to support the land trust’s conservation work). Donating the land releases you from the responsibility of managing the land and can provide substantial income tax deductions and estate tax benefits (while avoiding any capital gains taxes that would have resulted from selling the property). Donating a remainder interest in land: You can continue to live on the land by donating a remainder interest and retaining a reserved life estate. When you or those you’ve specified die or release their life interests, the land trust will have full title and control over the property. You can continue to enjoy your land and may be eligible for an income tax deduction when the gift is made. The deduction is based on the fair market value of the donated property less the expected value of the reserved life estate. Donating land by will: If you want to own and control land during your lifetime, but assure its protection after your death, you can donate it by will. You should make sure that the land trust is willing to receive the gift, and would be able to manage it according to your wishes. If you have land you would like to see protected for future generations, learn more about the options available. Contact the Interior Alaska Land Trust. 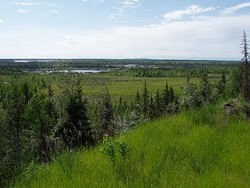 The Interior Alaska Land Trust has several publications that discuss easement and other conservation techniques. They include “Conservation Options: A Landowner’s Guide,” “Preserving Family Lands, and The Conservation Easement Handbook.” These are available for sale or loan.